You think that if you are a curvy woman, you can’t have a stylish look? Well, you’re wrong! 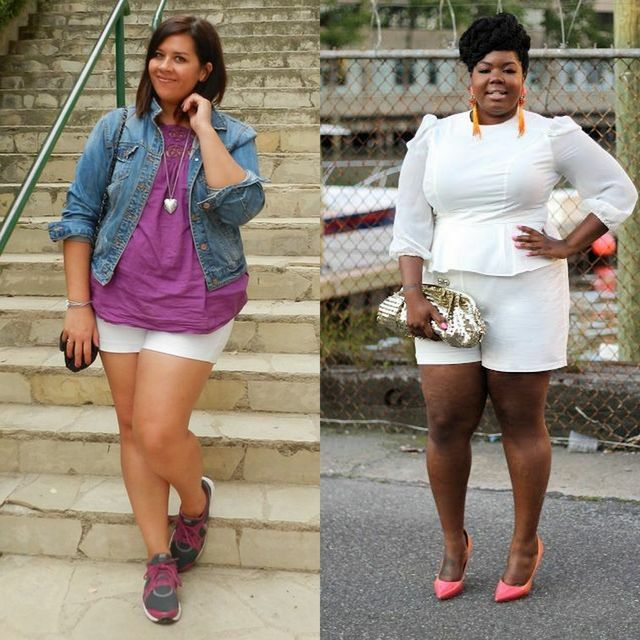 All you have to do is to follow some fashion tips for plus size ladies. You can wear anything you like, even shorts outfits. 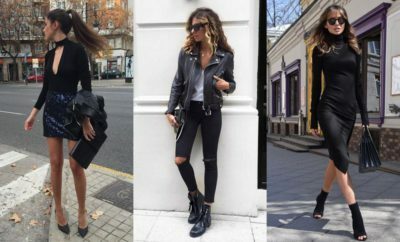 All you have to do is to adapt these outfits to your curvy silhouette and choose pieces of clothes according to your personality. 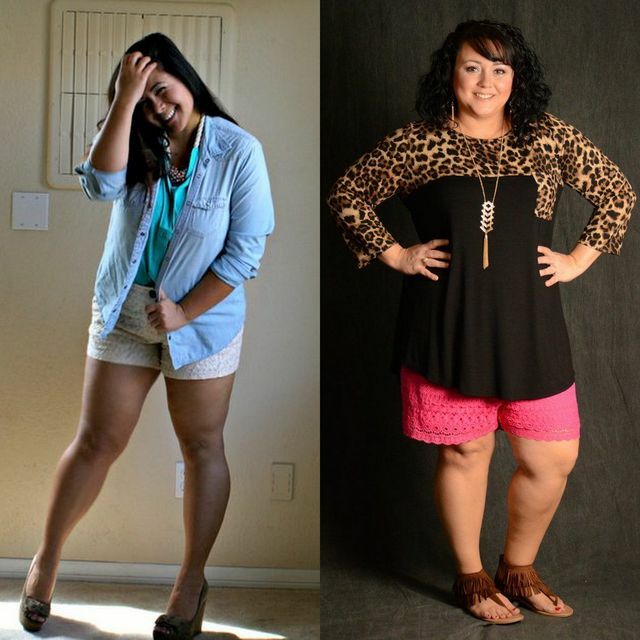 So, don’t expect to match and star working on your daily clothing styles with the help of these inspiring pictures with plus size shorts outfit ideas. It is really important to embrace your feminine curves and try some of these plus size style tips. Find clothes that make you feel confident and attractive. People are not all the same. That’s why the fashion industry thought also at plus size women and created shorts for plus size ladies. 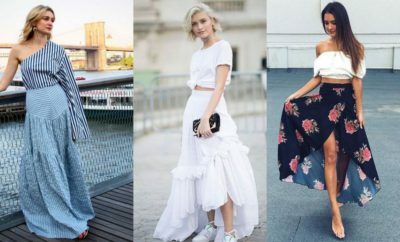 I hope these images will help you discover how would you look wearing shorts. Take a look at these pictures and star wearing shorts even if you are a lady with curves 🙂 . Denim is the perfect texture to outline your fabulous forms. 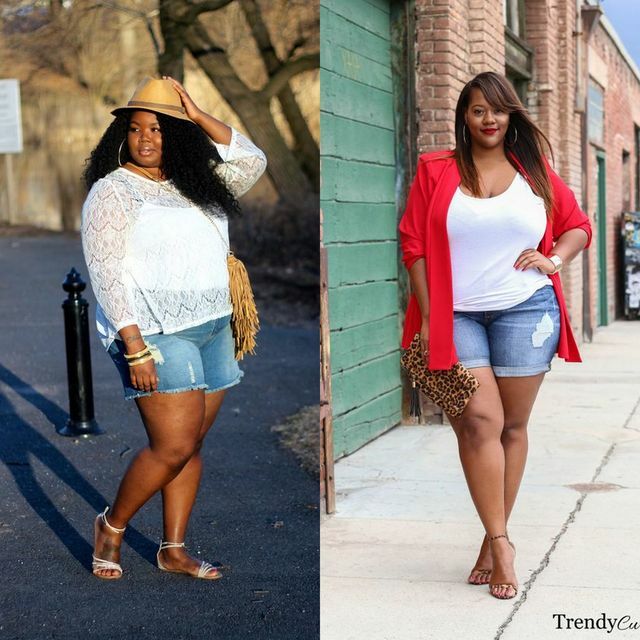 Our favorite plus size fashionistas provide you with numerous tips on how to incorporate the coolest shorts for larger ladies into your casual wardrobe. Sport the mid-length designs if you want to add some length to your legs. On the other hand, minis are perfect to emphasize your long legs if you are a tall woman. Team up your favorite fitting or baggy shorts with flirty and breezy summer blouses or shirts. We also adore the combos with peplum tops or simple T-shirts. 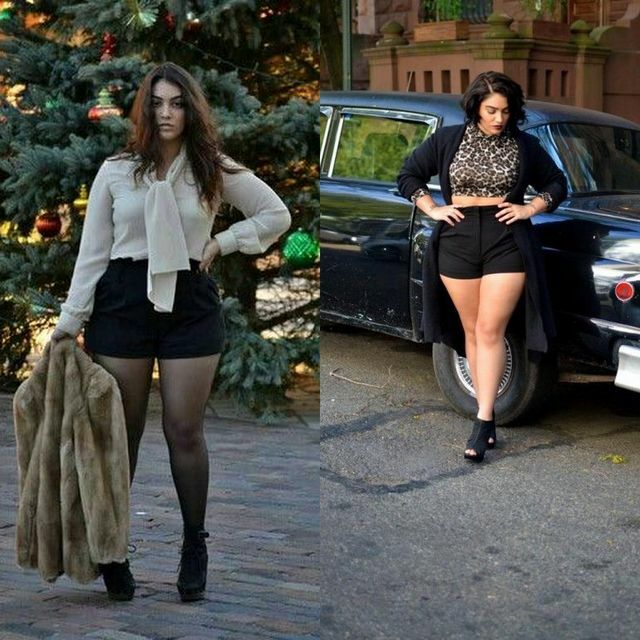 For the colder days make sure you have a blazer or a longer cardigan at hand to top your plus size jean shorts sets. Among the popular shorts designs for the upcoming seasons, the high waisted plus size shorts are definitely our favorite style items. There are very few wardrobe essentials that have a similarly huge positive impact on a curvy silhouette. Indeed, this special tailoring technique allows you to create the illusion or emphasize a narrow waist. Hourglass was named the most flattering body type of all times. 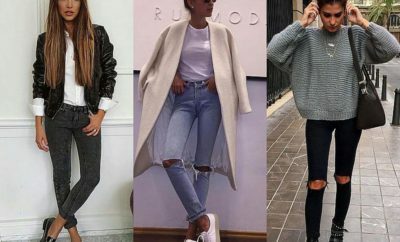 Therefore, pants, shorts and skirts with this special detail help you say goodbye to love handles and the exposure of a few extra kilos in the belly area. Gain control over the image of your body and use fashion to hide your imperfections! Jump on the shorts for plus size ladies trend matching denim shirts, blouses and long cardigans with printed or mono-colored designs. 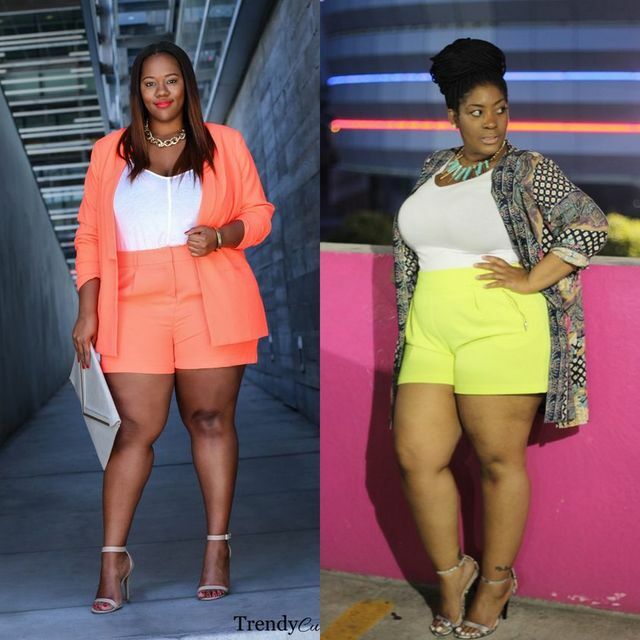 What do you think about these plus size shorts outfits? Lace speaks volumes when it comes to delicacy and femininity. 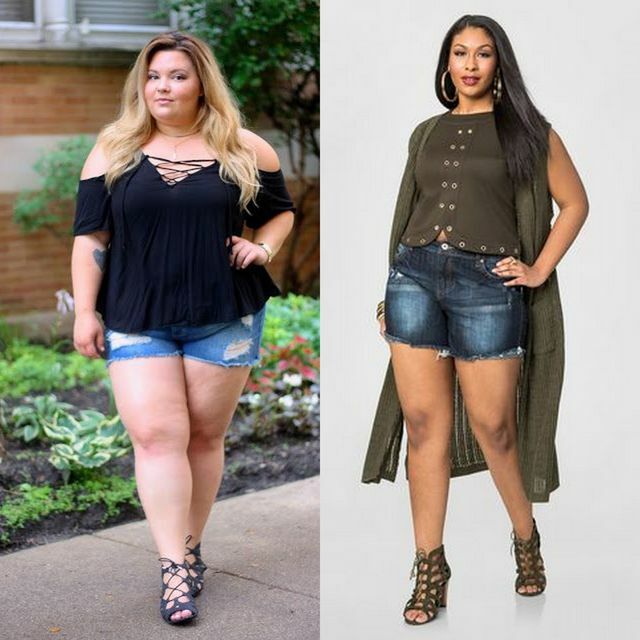 That’s why plus size street style divas are spotted wearing plus size womens shorts manufactured of this refined and admired texture both for special events and casual activities. The chromatic palette is positively overwhelming, you just can’t decide whether to stick to the classy black and white shorts or embrace the eclectic trend. Pastel and vibrant tones will add a touch of versatility to your clothing style. 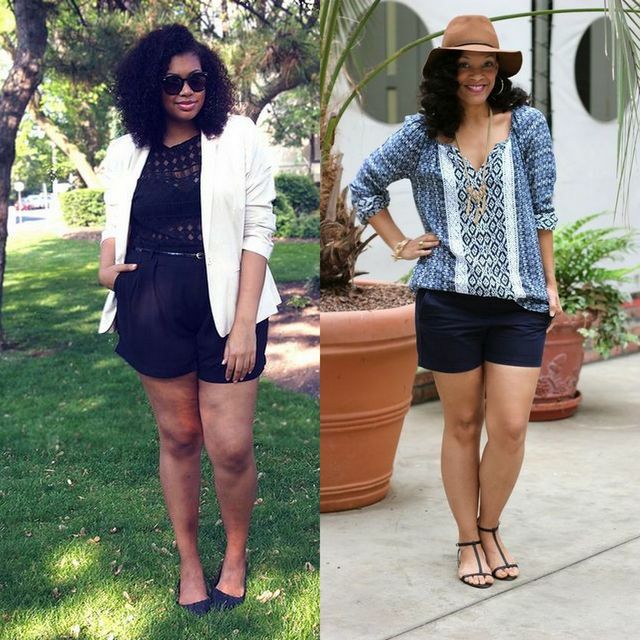 If you’re confident enough tuck your T-shirt or fitting blouse into the plus size shorts for women you’ve selected. In case you prefer moderate and traditional looks, go for fashion-forward shirts and tops. 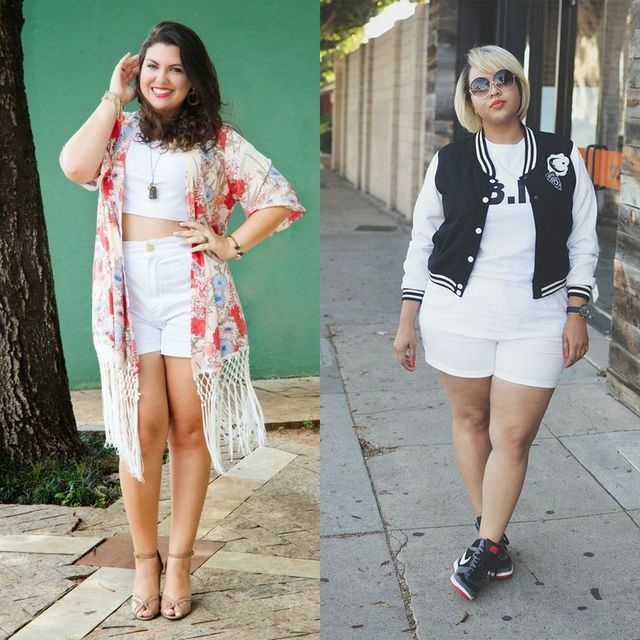 Let yourself be inspired by the plus size outfits selected by our team of experts! 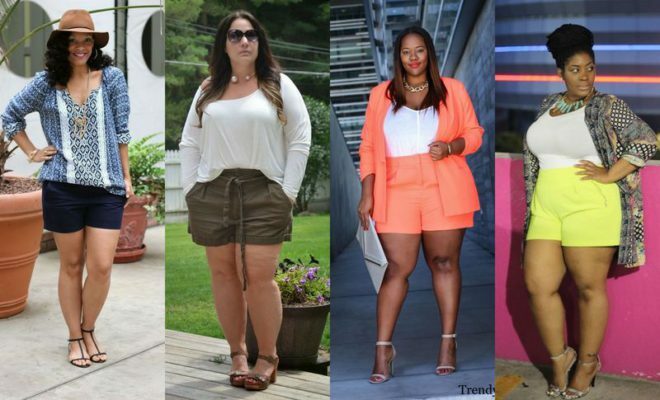 The chic black plus size shorts never went off our radar. According to trendsetters, if you are starting to embrace and love your curvy silhouette make sure you purchase a few pairs of mini or midi shorts in neutral tones. This way, you’ll guarantee the impeccable aspect of your outfits. Cotton, lace and denim are only some of the fabrics used to sculpt these gorgeous staples. Moreover, monochromatic pieces can be easily associated with printed tops, jackets and even blazers. 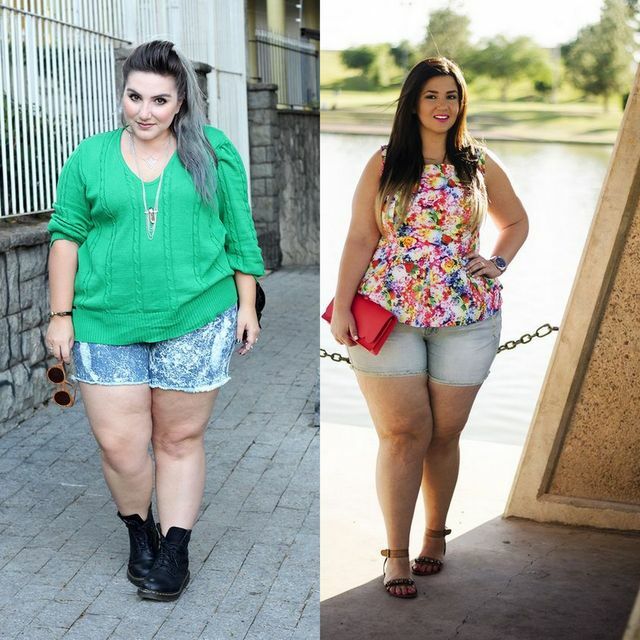 The shorts for plus size ladies trends evolve and continue to attract the attention of stylists and fashion admirers. However, no-one can deny the importance of a few multi-functional outfit elements in our dressing. Keep an eye on the newest outfit ideas that pop up in our trend reports! Wearing white regardless of the season and your silhouette is not a new concept. We thought it was a ‘must’ to include these gorgeous plus size shorts for women in our guide so you can have enough outfit inspo for the warm season and create daily outfits or clubbing outfit ideas for plus size. Surprisingly, these white bermudas and short shorts don’t add so much volume to thighs and buttocks as we would expect. Actually, high-heels and sandals can create the perfect balance and add length to a curvy silhouette. In addition, you have the shorts and sneakers pairings which are also spectacular and sooo practical. Choose the style alternatives you can nail down effortlessly!